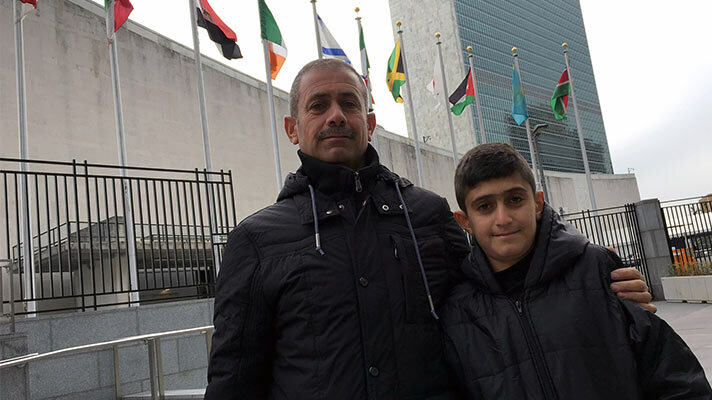 An Open Doors delegation – led by 12-year-old Noeh from Karamles, Iraq – has presented the Hope for the Middle East petition to the UN in New York. Noeh was accompanied by his father Hathem, Father Behnam Benoka, a priest from northern Iraq, and a team from Open Doors. The petition has been signed by more than 800,000 people in 143 countries. It calls for equality, dignity and a role in reconciliation for Chrisitians and other minorities in Iraq and Syria. “I feel genuinely convinced that we have found favour here – thanks be to God – and that the cause of our brothers and sisters in the Middle East ill be heard,” said Zoe Smith, head of Advocacy for Open Doors UK and Ireland. Members of the delegation were also able to meet with UK Ambassador to the UN, Matthew Rycroft who assured them of the UK’s commitment to minorities. In total 808,172 people signed the petition, of whom 186,390 came from UK and Ireland. Thank you for your amazing support. Noeh, his father Hathem and two church leaders all travelled from Karamles, Iraq to the USA to present the petition to the United Nations. It is the first time they have left Iraq. They were forced to flee their home, along with their whole family, to escape the self-proclaimed Islamic State, who burned down their house and took over their village in 2014. For three years, Noeh and his family found refuge in Erbil, but were able to return to Karamles earlier this year. They represent thousands of families in Iraq and Syria who have been forced to flee their homes with nothing, simply because of their faith in Christ. Significantly, among the 800,000 signatures on the petition are 64,000 from Iraq itself. The petition was addressed to the UN Secretary General and was received on his behalf by Kyoko Shiotani, Chief of Office at the Office of the Under-Secretary General. It would not have been possible to take the story of Christians in the Middle East to this level without all the prayers you have lifted up and the signatures you have gathered. Thank you. But don’t just take our word for it– it means to world to believers in the region. As well as presenting the petition to Chief of Office Shiotani, the team also met with high level officials in the UK, Dutch, German, Iraqi, Syrian and Vatican Missions to the UN, as well as with the UN’s refugee, development and political bodies and the UN General Assembly. Thank you again for making this possible. Please continue to pray for long-term fruit and impact from these meetings. For safe travels and good health for Noeh and Hathem as they return to Iraq this week.